Ce document au format PDF 1.5 a été généré par Microsoft® Office Word 2007, et a été envoyé sur fichier-pdf.fr le 08/03/2013 à 15:42, depuis l'adresse IP 82.127.x.x. La présente page de téléchargement du fichier a été vue 1631 fois. Taille du document: 77 Ko (8 pages). 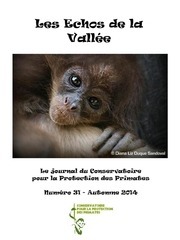 conservation programs for wild populations of primates. to studies conducted by citizens from the country in which the primates are found. 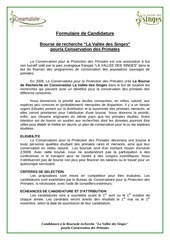 implement conservation plans for the species studied. support conferences, travel to scientific meetings, salaries or work for sanctuaries. be given May 1st and November 1st. office by April 1st or October 1st. Please use: Ms-Word, at least 12 point type, 1.5 spacing. Be to the point, items 1 - 5 should be no longer than 10 pages. Use the enclosed Project Proposal form as a cover sheet. the following suggested outline items only if appropriate for your proposal. institutional agreement form. We will not award a grant without this form. a. Prior research on the species involved. b. Prior conservation action for the species involved. c. Evaluation: how will success be measured? 8. Short bibliography and a map of the location of the project within the country. 9. C.V.'s of principal personnel. Two (2) pages maximum per person. permits) or statement that permits and permissions are not needed. 11. Completed and signed institution agreement form (part 3). involved in anyway with your project. The grantee's institution should fill out and sign this form. will not have any monies removed for administration, overhead or other purposes. The grant award will be used for the benefit of the above named recipient only. Ce fichier a été mis en ligne par un utilisateur du site. 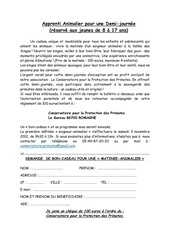 Identifiant unique du document: 00160518.